Order a limousine for your special occasion! Are you getting married? Do you want to celebrate your birthday? Do you want to have a special bachelor or children party? We offer Mercedes S 420 and Lincoln Town Car white limousines. 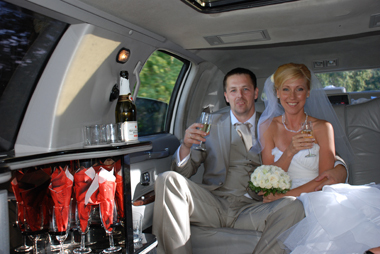 Our limousines have drink bar, sunroof (Lincoln limousine) and air conditioner. Upholstery is equipped with TV, DVD and CD players. We guarantee excellent service. Our limousines will take you everywhere at any time.We offer a professional and experienced chauffeur. Price includes gas, chauffeur and a bottle of champagne. If you order limousine for more than 5 hours, we will deliver it within 40 miles of Riga / Jelgava for free. We will deliver limousine Mercedes S 420 to Rīga, Ogre, Sigulda, Jelgava, Jūrmala, Olaine, Ķekava and Iecava for free (orders for more than 5 hours). We will deliver limousine Lincoln Town Car to Rīga, Jelgava, Jūrmala, Olaine, Ķekava, Iecava, Dobele and Tukums for free (orders for more than 5 hours). Our limousines are comfortable and spacious. There will be enough space for newlyweds, best persons and parents or 8 of your friends! Let us take care of your needs and you will enjoy the ride!